I’d like to talk to you about how you can write a great book really, really fast. For years I struggled with this. I knew that I had, not just one book inside of me, but many. And I knew that I needed to get that content out. I had clients and I had friends and family saying, “Hey, you should write a book.” But I didn’t know how. I was lost, I didn’t know where to start. I didn’t consider myself a writer – so I needed to ﬁgure that out. Then, I didn’t know exactly what my content should be – so that was confusing. I also wasn’t sure “who” should read the book. Etc, Etc. Etc… All of these things (and more) were holding me back from getting it done. But, eventually… I got focused. And made some of those decisions… but I still didn’t get it done. Talk about frustrated and upset! I’d even set the goal to do it, but then I wouldn’t get it done. Until… I ﬁnally ﬁgured it out. I’m proud to say, that last year, my family and I published 7 #1 bestselling books, and more than tripled our income. Better, is I’ve helped many people duplicate our success. Now, I’m gonna show you how you can ﬁnally get your book done, make sure you write the right book and making sure you can write it really, really fast. I know you can write a great book, and you can do it faster than you would ever believe. I want you to look at these few steps right here. Make sure you download the PDF so you can follow along. Your life story is probably awesome. But it isn’t necessarily the best place to start writing your book. But… That’s where you’re gonna get lost and waste a lot of time. Instead, think about your STRATEGY ﬁrst. Think about your book as already being done. 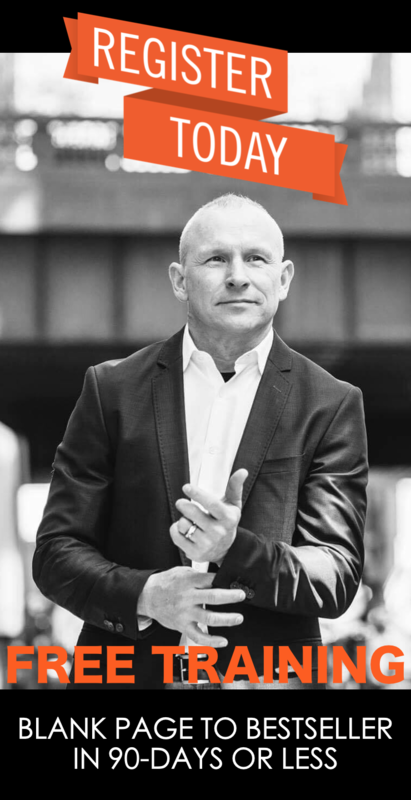 Imagine your phenomenal book being done in 90 days or less – cause that’s my promise in my Bestseller Big Business program – that you go from blank page to bestseller in 90 days or less. So lets start there… Imagine, for a moment, that it’s done. Imagine you just got the perfect cover. Who is this book for? Who is the perfect person to read your book? Remember: This is the strategy ﬁrst! What are you gonna do with this book? Imagine you were making a weapon. There’s a lot of weapons – you could have a knife, you could have a spear, you could have a bow and arrow, a gun. But for the sake of argument… I’m sure you can imagine that a different weapon would be used for different purposes. A sword might be a great weapon, but it might not be the best weapon if you were in a small space, or jumping out of an airplane! You want to know “what” book you’re going to write! Because… the wrong tool, the wrong book, the wrong weapon (I don’t know why I used that example), is not gonna help you if it’s not used in the right situation. And then, what do you want them to do next? See, because most people don’t think about this. They’re all caught up in their own head, and their own silly stories, and they get confused, or overwhelmed. If you consider your strategy ﬁrst. And you think about what you want your book to LEAD PEOPLE TO… (aka – what are they going to buy from you, and how you’re going to SERVE them next… ) you’re way ahead of the game. When you do that, you’re going to help the people that you want to help, make a difference. But I wasn’t helping them. I wasn’t getting my information to them. You put your best stuff, the things that you “know,” and that you “do” better than anybody else (your magic mojo), and put that into your book! Then think about, Who wants that information? Who needs it? You’re gonna put all your best stuff in there. Don’t start writing it yet. Just think about “who’s” gonna read it. Oh… it’s this part that’s key. Strategically, where are you leading them? On one of the other videos I have, I’m gonna share with you how do you MARKET your books, so that you can get your book in front of the right people, and then also, how to MONETIZE it. But that’s what I’m talking about. Your book needs to make a proﬁt. But you need to know: Where are they going to go next? I watched Al Gore give this great speech about how the world was melting. It was all about global warming. After watching this video, this presentation, I was so moved! But… since Al didn’t talk back to me, and he was just a video… that was it! He gave me nothing else. Where was the “call to action” at the end? What was I supposed to go do?! But I couldn’t ﬁnd anything. At the end of his presentation, he gave me nothing. I then looked online to try to ﬁnd something. Was did Al Gore recommend? Replace my light bulbs with ﬂuorescent light bulbs. And go buy a Prius. I didn’t know what to do, I was helpless. But, I want you to think about this for a minute… in the context of your book, BEFORE you write your book. What do you want them to do or think or transform? Then, what do you want them to do next? Because your book is only gonna sell for what? Or whatever it’s going to sell for… it’s gonna be very difﬁcult for you to actually make a proﬁt only selling your book. But, don’t you want to make sure that you write the right book for the right person, so that you get to attract the AMAZING PEOPLE into your life that you get to help and transform, and change your lives? That’s one of the reasons why you need a book, right NOW. There is no better business building, or branding building tool on the planet – than your book. When my wife and I ﬁgured this out, I made it my MISSION (my obsession) to build a TEAM of people around us to help us write books. I wanted my family to write books. I wanted my clients to write books. And now, YOU are going to get to write YOUR book. 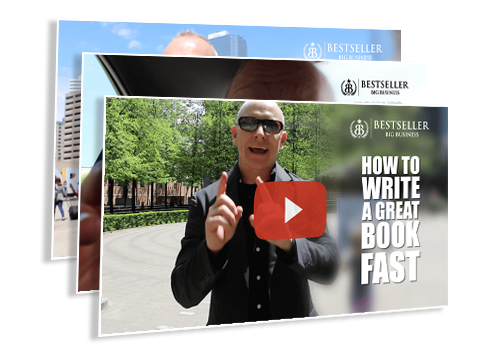 Then, in another video, I’ll show you you can become a #1 Bestselling Author. I think I already said this, but my wife and I tripled our income last year with books. We wrote seven number one best-selling books. Two of which were done by my daughter. My daughter was seven when she wrote her ﬁrst book, eight when she wrote her second. Now, you can do this! It all starts with Strategy. And, who do you want to read it? Now that you’ve answered those questions, let’s move on. So, what’s the next thing to work on? The outline of your book. Now, I told you that this video was about how to write a great book fast. We’re at the part of you outlining the path you want them to go. What do you want them to learn during this process? Again, don’t get caught up on all the stories, don’t go do that. First consider your table of contents, and make sure that it makes sense. Make sure it’s going to communicate to people: where you want them to go. This is going to be your outline – your table of contents. Design your “treasure map.” Take your reader from A to Z. Now you understand WHO this book is for, and WHERE you want them to go next. Now, you also have your structure and content outline done. Now it’s time to insert your stories. See, if you do this in the reverse order, it all gets so confusing. Thinking about what stories are you gonna tell… is quite frankly overwhelming. But that doesn’t mean you should put it ALL in your book. Once you have the strategy and the structure ﬁgured out… you can add your best stuff (content) and your incredible stories. Now, you might be thinking… But Trevor, “how” am I actually “write” this sucker? Good question. And, I’m gonna share that with you next. Plus, how to write it quickly. Oh and there’s one more thing! Before you get to the writing of your book. 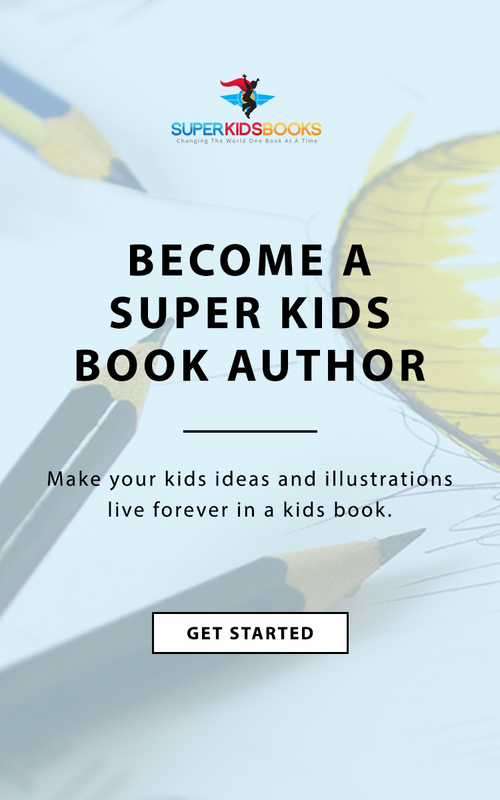 The ﬁrst think you need to do is set a date that your book is gonna be published. Once you understand the strategy, structure, story, like what’s the outline of your book and you’re ready to put the stories in there, and now you’re ready to do it, tell the world! You want to set the date of when it’s coming out. Nothing motivates you like having a deadline and a date, so set that on your calendar. Now, let’s get to the writing part: speak it, scribe it, source it. You don’t actually have to “write” your book. Obviously, I’m here on video. I’m sure you can talk as well. Basically, you can SPEAK your book. You could talk it out, during a tele-class. Maybe you could be interviewed by a friend of yours. My 7-year-old daughter told her story into my iPhone. Then we had that transcribed. We call this a combination of SCRIBE & SOURCE. Because my daughter certainly didn’t “write” all of the words on a paper for her book. Now, of course, you could choose any one of these. Perhaps you like to write? So you can choose to sit down with a pencil and paper, or your computer and type away. If so… awesome! 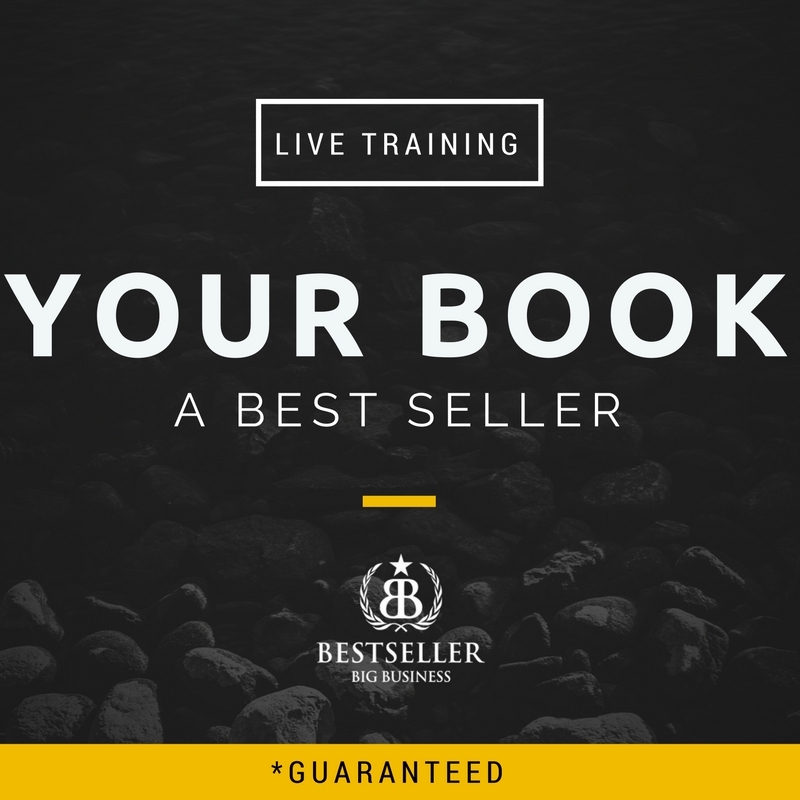 For my ﬁst book, I taught a webinar to get all of my best content out of me. Any idea what that was? Meaning, I gave people a chance to buy something from me. And I got my content done for my book! Plus, it made organizing my content and telling my stories super, super simple. I took my spoken word, recorded it. Then, I had it transcribed. I had somebody write it for me. They turned all that into words. I like to use all three: Speak + scribe + source. Remember, you can use any one of these. Or, all of them together. Sourcing means that you ﬁnd somebody else to help you write your book. See, most people think that you need to write a book by yourself. Instead, you want to go ahead and write your book right in the open. You want to do it right now, in the middle of your busy life. Do you think that you might be able to give your book to them? Do you think that would help you convert them into your client? What would your book need to be about, so that they would want it, and want to possibly work with you, and buy your products and your services? You could get one more clients with THAT book? Maybe that book might help you get two more clients? Do you think you might be able to get maybe some speaking engagements? How about, traditional media? Or other online media? That’s one of the ﬁrst things people see…your credibility and authority. It sets you apart from the riffraff. Or, is it possible that people you’d “like to meet,” might be willing to be interviewed by you, for your book? And, of course, it’s gonna make it easier for you to get clients. How much is the average client worth to you? One time? Or, how about in a lifetime? Is it a $100? I certainly hope it’s more than that. I hope it’s at least a $1000. Or maybe it’s $50,000? What is one client worth to you? 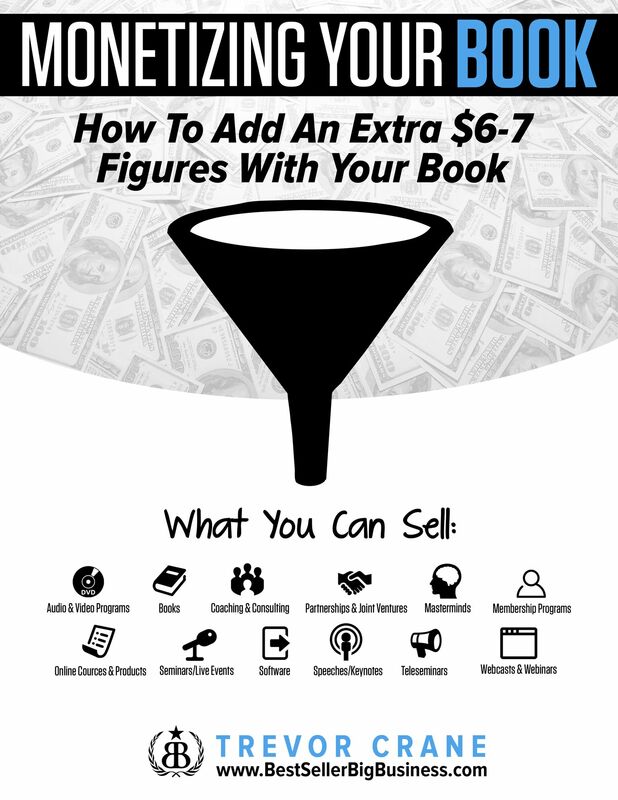 What is it costing you right now, every-single-day, that you DON’T have a book out there that’s working for you as your MOST POWERFUL MARKETING TOOL? So you need to get it done. Next, I’m gonna show you on the next couple of videos how do you market it, and how do you monetize it. But you need to know HOW. Because most people WON’T make money with their book. Because they get this WRONG. Instead, they make a little bit of money. Rarely, do they ever even recoup their investment. No, I’m talking about that, I’m talking about the big money. Money that’s gonna help you spend more money on marketing. Money that’s going to help you make a difference. Money that’s going to help you, help more people. 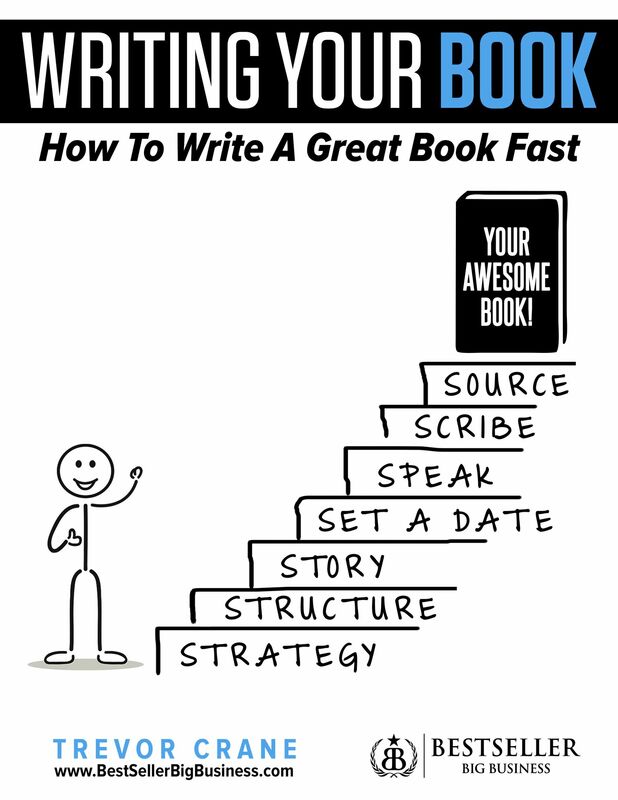 Those are the ﬁrst things to consider, to help you write a book fast. Then you want to set a date. And you can from blank page to bestseller in 90 days or less. This is just a little insight into “how” to actually it done, and get it done quickly. Strategy First. Structure Second. Story Third. Then you speak it, scribe it, source it. Now, hey, if you don’t want to do it that way – no problem. My father-in-law doesn’t want to speak out his stories. He’s in the process of writing his memoirs. He’s in his 70’s, and he likes just writing it out. He does it when he travels. It gives him something to do while he’s traveling and on a plane. And he likes to be the person to “scribe” it out. If that’s you – awesome. But if you want to do it fast, trust me: Speak it. Scribe it. Source it. And don’t do this alone. Don’t do it in a vacuum. Don’t try to make it perfect, and then share it with the world. See, I thought I had to do all of it alone. It’s not the way intelligent people do it. Would you go build it by yourself? Or would you maybe get some help? Would you get an architect? Would you ﬁnd an electrician? Would you have somebody do your faux painting? Would you have a different person do your rooﬁng or your plumbing? Your book is part of your legacy. Your book is something that you get to give back. You get to give it to the world. It will help establish your legacy. This is about you living a legacy, not just leaving one. So I want to go ahead and invite you to download the PDF and if you’re not signed up for the webinar yet, be sure to register. There, I’m gonna talk to you about more of the details, to help you go from Blank Page to Bestseller in 90 Days or Less. Now, and over the next couple of videos, (which I know you’re gonna love), I’m going to talk about marketing your book. And how you can use it as your MOST POWERFUL MARKETING TOOL for 12-18 months, at minimum. 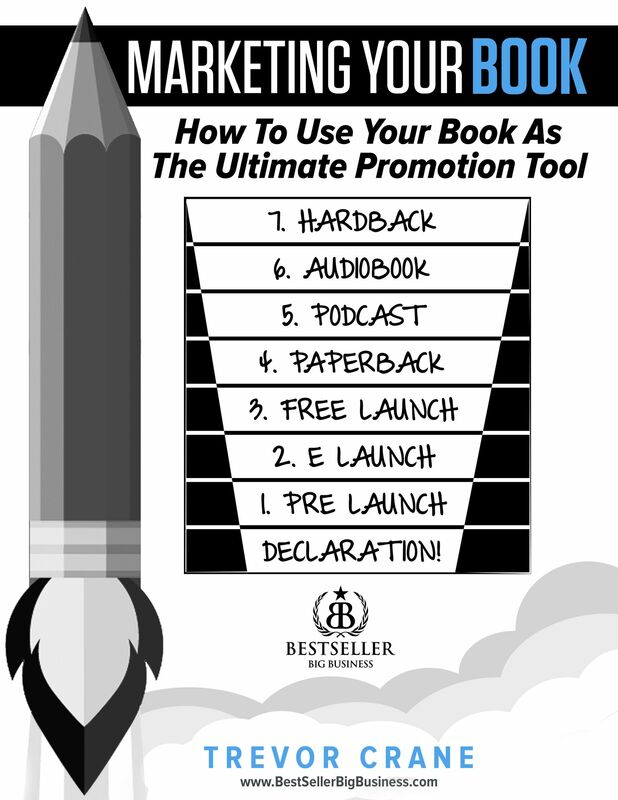 I’m gonna go through all of the 7-phases of your EPIC Book Launch, and how you will get your book out there into the world… into the peoples hands that need it most. How do you make money with your book. I’m gonna cover – there’s 12 things, and I’m gonna cover 4 of them, that are gonna help you with how you can make 6 to 7 ﬁgures within year one, all right? 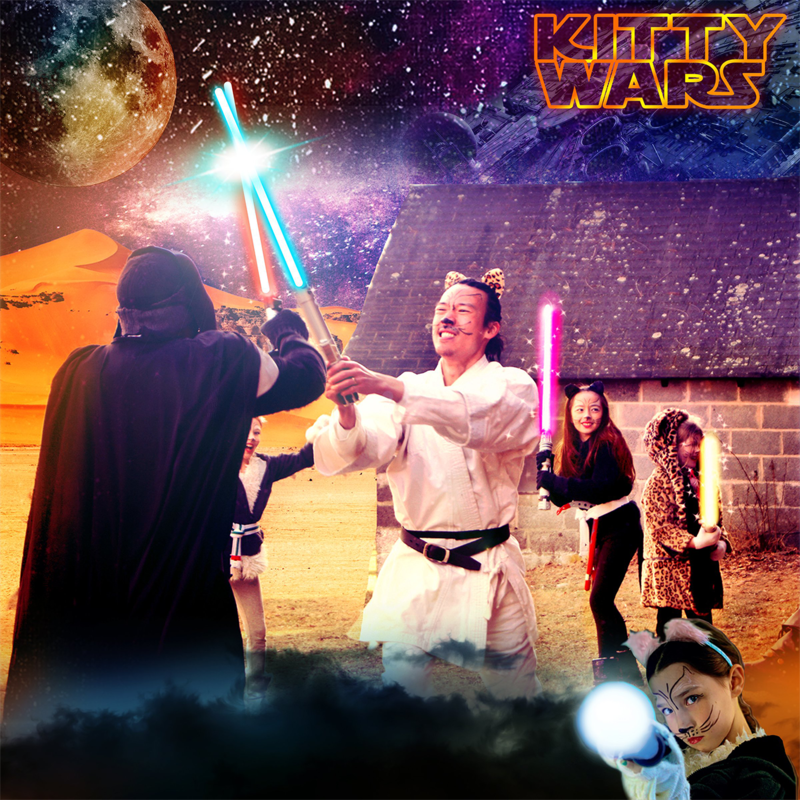 I hope you love this and I look forward to seeing you on the webinar and the next training!